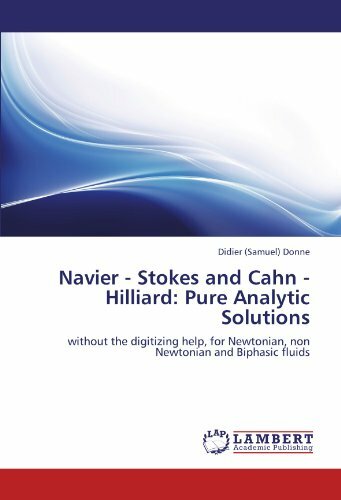 The current book is a presentation of the pure analytic solutions (exact or approximates)of the CAHN-HILLIARD & the NAVIER-STOKES equations. These last ones are very useful to the airplane and the navy industries , to the meteorology and oceanography specialits , to the enterprises specialized in the Computationnal Fluids Dynamics (CFD), and of course to the mathematics and fluids mechanics lovers. This book is the third of a collection which has as main link , the "gradient of time". This theory is linked to one result of the theory presented by EINSTEIN in 1905 : the "time dilation". This collection of three books , use the time dilation to simplify and solve the Partial Differential Equations. It also presents a new way of thinking the general and special relativities , giving the possibility to don't use the light speed. The solutions written in this book are simple , easy to understand and mathematically strong. These ones have been conceived to give an entire satisfaction to all the science fans . The author holds a master in mechanics, with a specialization in fluid mechanics research. Alumnus of the French university of Lille , also called "USTL" or "LILLE 1" , he is currently teacher in mathematics in high school in FRANCE.